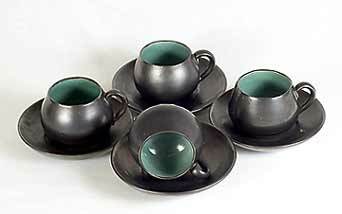 Lake's cups and saucers - 2½" (63 mm) high, 5" (127 mm) diameter. W H Lake and Son founded their pottery in Truro, Cornwall, in 1872. It is said that there had been potteries on the site going back to medieval times. The company produced attractive earthenware pots. It is particularly noted for its large bowls and pancheons, made for an age when outside toilets, copper wash boilers and coal- or wood-fired kitchen ranges were the order of the day; when home baked loaves were the daily bread. These pots, in that era, were essentials of domestic life. The pottery's output was prolific -- it served the entire Cornish community. In 1920 Bernard Leach, when explaining to the people of St Ives the type of work that would be carried out at his new pottery, cited a Lake's pot as the type of product that he wanted to make. The influence that Lake's Pottery (often referred to as the Truro Pottery) had on the Leach Pottery cannot be over-emphasized. Bernard, his two sons and the apprentices were regular visitors to Truro where they would watch the two potters Pascoe and Venn at work. Venn was the thrower and Pascoe pulled the handles. Bill Marshall, who is often quoted as Britain's finest thrower, still holds these two men in awe. When Venn retired Pascoe continued, doing all the potting himself. Henry Venn had previously owned his own pottery in Truro, but following the end of World War One, and the shortage of men that it caused, he went to work for Lake's in 1920 taking Barry Pascoe with him. Another of Lake's potters who joined the company a generation later was Michael Edwards who went on later to Bolingey Pottery. After Bill Lake's death his wife carried on running the pottery, and it continued in production until the early 1990s when it was destroyed by fire.